Using only 4 main ingredients, this is a family favorite meal. It’s quick, delicious and frugal!! 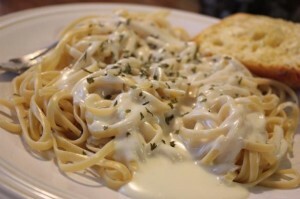 For years I have made this super easy Alfredo Pasta recipe. The SECRET is the cream cheese! This is what I call a “Convertible Meal” which means once I make it I will convert into several other meals and no one will know we are eating leftovers. I tend to double my Convertible Meal recipes — see my suggestions of additional Convertible Meals below. I start my pasta water at the same time I begin the 10 Minute Alfredo Pasta Sauce and they are ready to serve at the same time. Using medium heat, melt butter in medium sauce pan then add cream cheese to melted butter. Stir with whisk until smooth (about 3 minutes). Add garlic powder and pepper. Add milk a little at a time stirring with a whisk to keep sauce smooth. Stir in the Parmesan cheese. Continue to stir Alfredo Sauce until desired thickness is achieved in just a few minutes. If it is too thick for your liking, add just a touch of extra milk. TIP: Be sure not to boil recipe or the milk and butter will separate! Make a double batch of this recipe and convert into several meals. I use what I have around the house and adjust my recipes accordingly. I use whatever cheeses I have in the freeze (I buy cheese when on sale with coupons and freeze it for cooking). Want to add some vegetables? Add fresh or frozen spinach to the chicken mixture below. Mix cooked chicken, ricotta cheese, garlic, basil, oregano and Parmesan cheese. Cook lasagna noodles according to package directions. Place 1 cup Alfredo sauce in bottom of lasagna pan, add one layer noodles, spread noodles with chicken mixture and 1 cup Alfredo sauce. Continue layering and end with the final cup of Alfredo sauce and 1 cup of cheese. Bake until hot inside. 350 for about 35 minutes.